The installation, Cross-Pollination (II), questions our assumptions about the disorder of nature and the sterility of human bodies and spaces, finding whimsy, design, and beauty among the apparent chaos. 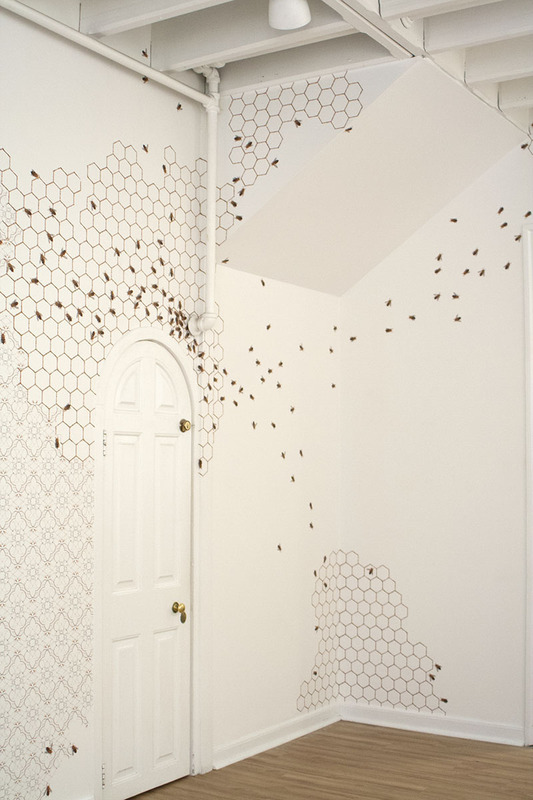 Bees emerge from vents and pipes in the gallery space, dismantling the filigree pattern to interpose their own structure on the walls, yet periodically also coming to rest within the geometry of the pattern. 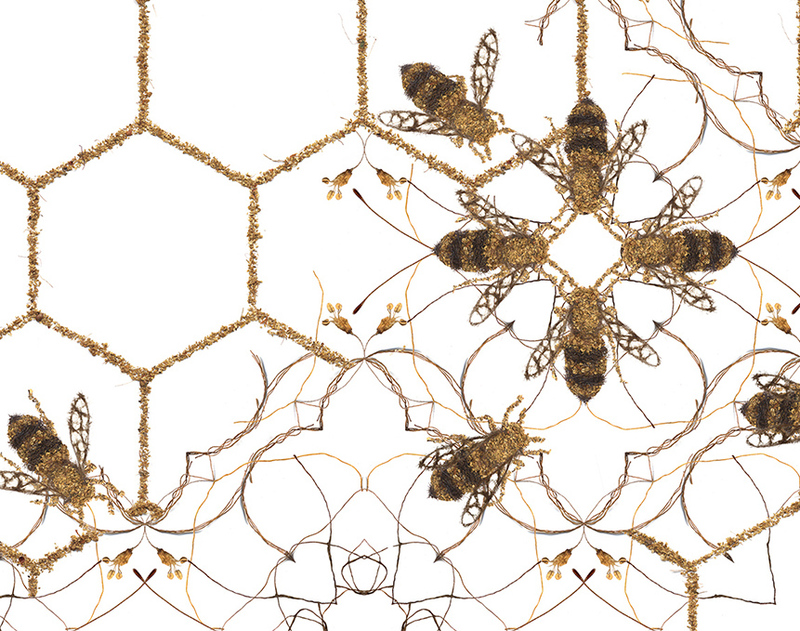 The pattern, honeycomb, and bees, are all composed of the same natural detritus - dried flower stems and stamen, bug parts, and human hair. 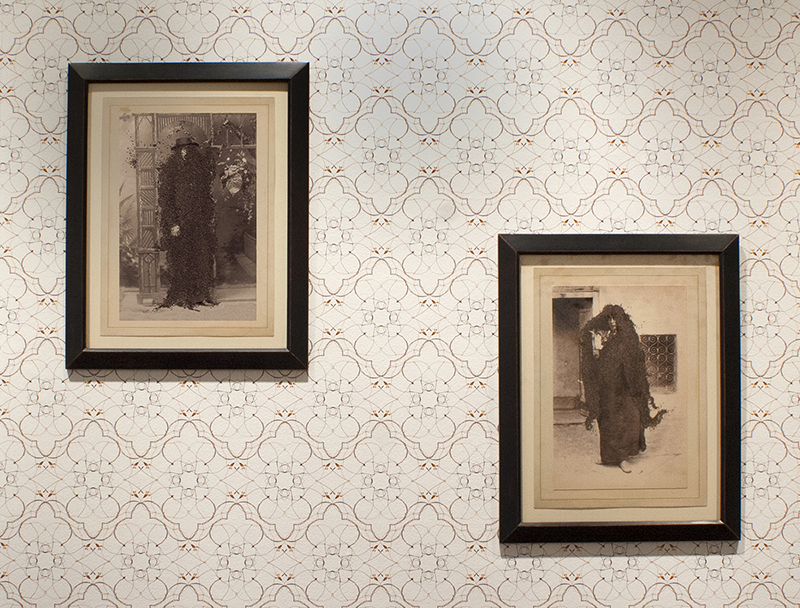 The altered photographs in the room suggest a similar story happening outside the walls of the gallery, further blurring the lines between outside and in, chaos and order, but also history and present. The grouping of photographs brings together images of Victorians with 19th century images of Arabs and North African landscapes. 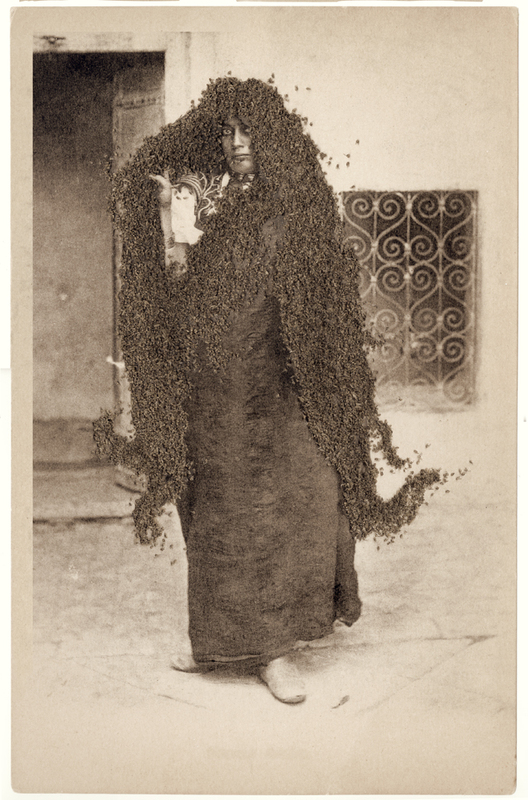 Insects and other natural detritus consume the faces and bodies of the sitters, transforming their hair into chaotic swarms, or subsuming surrounding spaces. 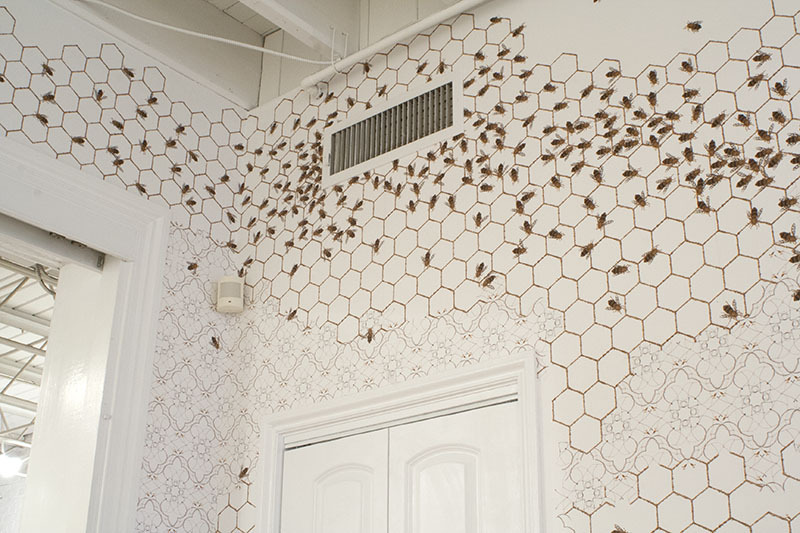 The swarms and drifts point to the relationship between chaos and design in nature, but also become metaphors for expressing that same balance between order and entropy within our own bodies. The series of prints, Colony, pairs altered portraits of 19th century Westerners with altered Orientalist postcards taken and traded by Westerners in the Colonial era. The themes of sensuality, concealment, and exposure, already implicit in Victorian and Orientalist imagery, are taken here to an absurd degree. The comparisons play with assumptions regarding the colonizer and subject. Here, the insects are the invaders, modestly cloaking the body of “Une Belle Morocain”, or burying a Victorian man in the chaotic swarm of his own beard. The process involved in making these prints includes digital and manual means. 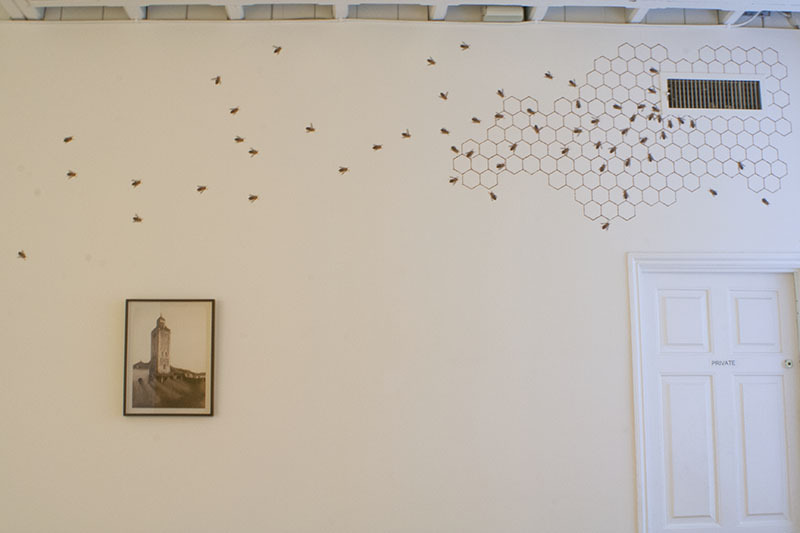 The swarms are created by gluing flies directly onto a print of an antique photograph or postcard. The collage is then scanned, and reprinted. Many of the prints are composed of two prints with different surfaces to mimic Victorian cabinet cards or a page from an antique photo album. Archival Pigment Prints, Each 5" x 8"
In my series, Coiffed: A Typology of Entropic Variations, the swarming beards and hairstyles take our attempts to control our bodies to an absurd degree, with a playful exaggeration of the quotidian frustration of taming our hair. The identity of the sitter is eclipsed by his or her hair, which takes on a life of its own in the form of a swarm of insects. In contrast to the classic carnival act in which a tamed bee swarm envelops the face of a performer, here the swarms grow; run wild; start to conform; then run wild once more. Even as we attempt to impose our will on nature, these insects impose their anarchy on us. Installation Views: (dis)-order, Delaware Center for Contemporary Arts, Wilmington, DE (Images 1-3) and Private Collection (Image 4). Sixteen Archival Pigment Prints, Each 17" x 17"
In this series based on a Victorian typology of facial hairstyles, hair is replaced by a swarm of flies that seem to subtly vibrate in an abject mass. The shapes, ranging from the familiar “Boxed Beard” to the absurd “Houlihee,” are playful illustrations of the sculpting of body hair, and the taming of unfettered growth. Juxtaposed against this careful manicuring, the potential for disorder and deterioration is suggested by the flies that hover around the periphery of the shapes. 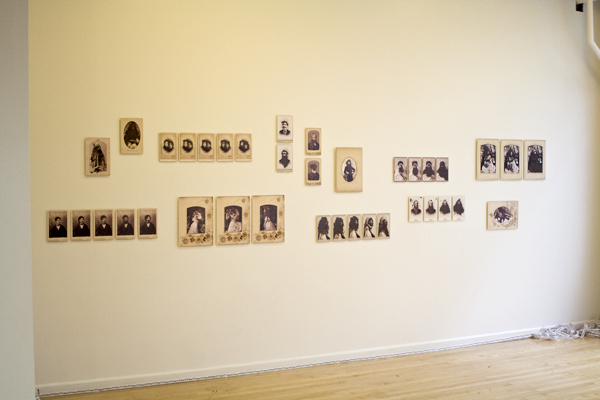 Installation view: Painted Bride Art Center, Philadelphia, PA.